Transport – it’s all around us all the time, but how often do many of us actually think deeply about it? Beyond banging our steering wheel in frustration at gridlocked traffic or a slow truck, or having an opinion about driverless cars, that is. Which brings me to electric vehicles (EV), one of my favourite topics of conversation, but one which has had very little real attention – public, private or government – in New Zealand so far. The subject’s seeing renewed public interest at the moment, due to the historic COP21 declaration and our PM’s prediction that we might all be driving electric cars within a decade. While that latter change is unlikely, given the average age of our car fleet is over 14 years and set to rise further, change is definitely in the wind. I recently had the unrivalled experience of getting to hoon slightly potter about in a Totally Adult Fashion in a Tesla P85. Woof. The web comic Oatmeal was right. 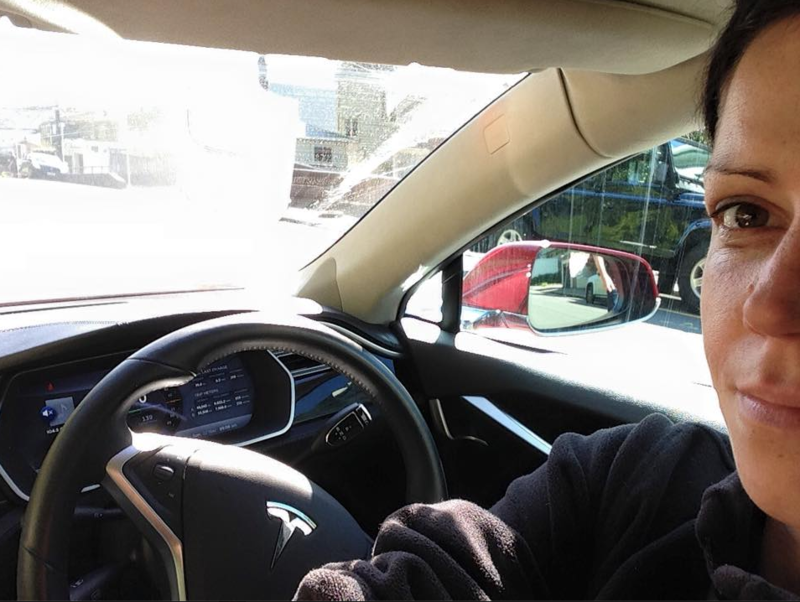 I’m having to restrain myself from basically writing this entire post in the form of “OMG I DROVE A TESLA!” repeated 100 times. A common misconception about electric vehicles s is that they’re less fun and/or powerful to drive. That they’re not Real Cars. This is a nonsense. The problem with internal combustion engines is they need to use gears to travel at increasingly fast speeds. And all of them have their own specific “power band” – the point at which the car’s engine has access to optimum torque and, essentially, ability to accelerate at maximum power. But this power band is only, well, available in a band. EVs are different. Their torque is available constantly. This means that, when you put your foot down, no matter what speed you’re at (and gear is a non-question here), you have access to all the power all the time. Cue maniacal laughter. And because of the way the “engine” works, you’ve got a bonnet which you can use to store stuff, a backseat the middle of which can fit in people who are normally-sized, and a centre dashboard in the front which you can also use to store stuff other than a handbrake and clutch. I tell you, it’s madness. But madness of the sort you could very easily get used to. Yeah, but those are Teslas. What about cars for the rest of us? At well north of a 100k, yes, Teslas are well out of reach for most of us. At least at this juncture. UPDATE: Check out the Arcimoto! Well, depending on the situation. I definitely wouldn’t want to try and take it on long road trips through the North or South Island, because of the Range Issue. One of the major hurdles to EV adoption in NZ has been the dearth of charging stations. It’s one thing to plug your car in overnight while you’re at home anyway, but it’s entirely another if you want to go on trip longer than 140km or so. Charging stations are the solution – able to offer “quick charge” capabilities, which take about 20 minutes to charge your Leaf (say) to 80%. That’s about the amount of time you want to stop anyway to grab a beverage, blow on your pie, go to the bathroom and stretch your legs. But there’s a problem. There’s been no real government support for these stations, due to the classic chicken-and-egg problem of “there aren’t enough EVs, so it’s not worth installing charging stations :: there aren’t enough charging stations, so it’s not worth buying an EV”. Thankfully, charge.net has taken it upon itself to sort this problem and break the cycle. It’s installing a network of charging stations – as a pilot programme initially – throughout NZ in places where people may spend 30 minutes or longer during the course of their day. Like New Worlds, and shopping centres. Down the line, there’ll be a network of stations along NZ’s major arterial routes, meaning even wee EVs like Leafs can make the trip in a sane amount of time. They’ve also just announced a deal with Z Energy, with 6 charge stations to be installed in Wellington, Christchurch and Auckland by the end of Feburary 2016. Why do I care so much about EVs? A number of reasons, really. They range from the silly to the serious. The tech is very cool. And I’m a techno/neophile. So of course I’d like them. They feel like the Cars of the Future. They are ridiculously fun to drive. EVs are a lot cheaper to run – about 30c per litre as opposed to $2 plus. Seriously, energy security/independence is a very important issue. The fewer energy sources we have to import, the better! EVs produce around 80% fewer emissions than petrol- or diesel-fuelled cars. Transport emissions are a major problem worldwide. In NZ, they constitute about 20% of NZ’s total greenhouse gas emissions. Emissions cause a raft of health problems due to poor air quality, and contribute substantially to climate change. NZ’s electricity generation system is already primarily sustainable, and going to get more so. So the environmental benefits of switching to electric cars are particularly persuasive – unlike in other countries, where a lot of electricity might be provided by coal-fuelled power stations, for example. 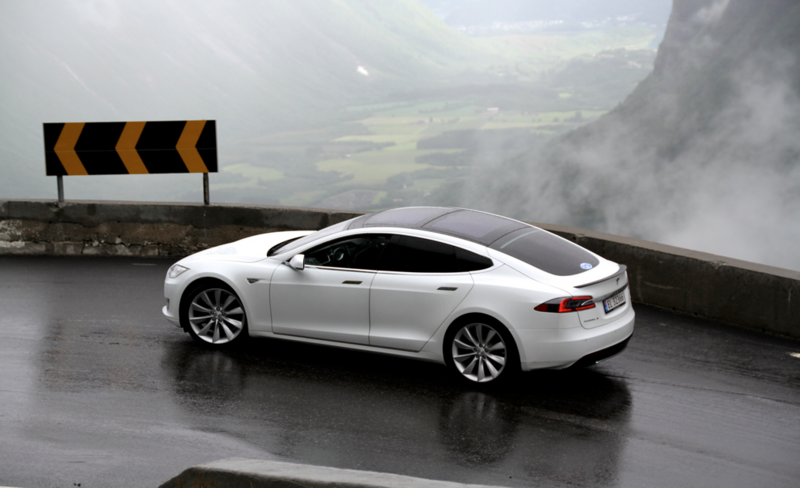 The EECA EnergyWise site lists a bunch more EV advantages, too. So, I guess what I’m saying is that EVs are cool. And increasingly within our reach as consumers. And it’s a very serious and meaningful step to take if you’re someone who cares about health, the environment, climate change or just Very Cool Toys. And yes, on a personal note, I would love to see Wellington pioneer the uptake of these sorts of vehicles. Disclaimer: I GOT TO DRIVE A TESLA. Otherwise, no money or anyfink changed hands. I genuinely am this excited about EVs and their potential. I got to drive a Nissan Leaf, too, which was also very cool indeed 🙂 Thanks to Sigurd Magnusson! I’ve been really fortunate in getting to be a part of some really interesting futurecasting work here in NZ. You might find them interesting, too! I don’t think a glorified mobility scooter is going to get anyone salivating over the prospect of their own electric car. Wish it would, don’t see it happening. Uh, your website suggests headquarters in Oregon, going to ship one out to NZ for me are you? 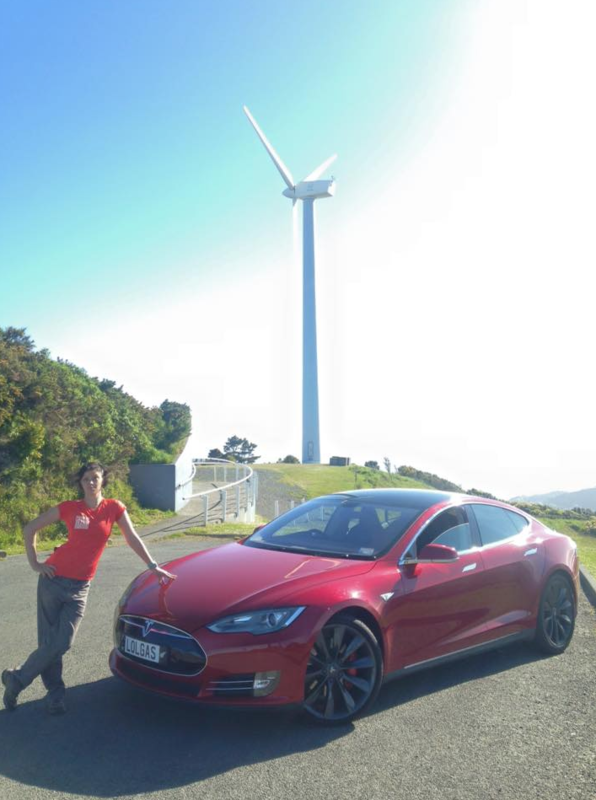 We met LOLGAS (the red Tesla) here in Invercargill, the Leading the Charge team having completed a tour of New Zealand. OMG YOU DROVE A TESLA! ?